Neco H373C 1 1/2" to 1 1/8"
Integrated head set for 1.5" bottom to 1 1/8" top race. Aluminium with sealed bearings, 45° x 45°. 52mm width of lower bearing, 41.8mm width of upper bearing. Black anodized, 79 grams without adjuster. Supplied with adjuster for carbon steerers. 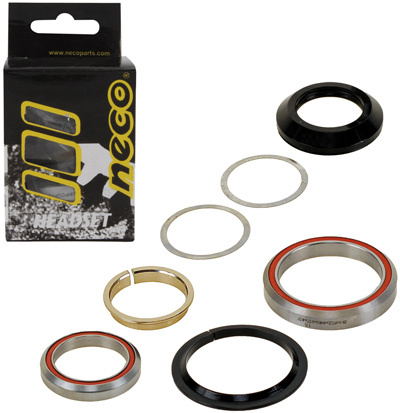 Neco H398 1 1/4" to 1 1/8"
Integrated head set for 1 1/4" bottom to 1 1/8" top race. 47mm width of lower bearing, 41.8mm width of upper bearing. Black anodized, 77 grams without adjuster. Integrated head set for 1 1/8" steering columns. Black anodised aluminium top with o-ring seal and without logos. Sealed cartridge bearings Campagnolo standard (41.8mm x 45° x 45°). 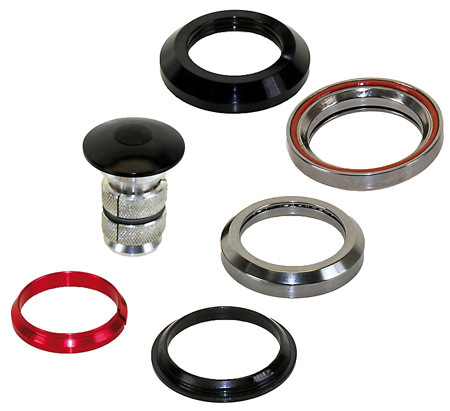 Supplied with carbon steerer compatible bung with black anodised top cap.